I would like to get everyones opinion on what the difference between these two woods are. There are a lot of different opinions and I’d like to get to the bottom of it. I won’t start with my opinion but will offer it along the way. Thanks!! Well, I can’t let this one go by. Curly happens mostly in Red or Soft Maple. Curly or Tiger it’s really the same name for the same thing. There are diffrent degrees of curl however, from a soft roll to sharp contrasting stripes. When someone asks me for fiddleback maple I assoiate that with quarter-sawn curly maple which would be most desired for fiddle-backs. Hard or Sugar Maple can also contain curl. 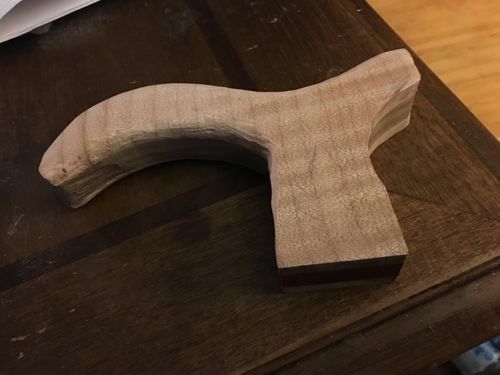 It is a lot harder to find Curly Hard Maple and the Curl is generaly tighter in pattern, I have found Curly Hard Maple to be more 3-D in apperance. I once sold a guy 1000 sq ft of Curly Hard Maple flooring, It was mind blowing, almost hard to look at. I have always said that they are the same thing. Check out what these guys are saying. Can’t say that I’ve ever seem figuring on Maple that goes with the grain. I have always considered “tiger” to be a more intense or exaggerated form of curly. “Curly” has several “grades” that deal with the consistancy and depth of the waves. We do many board feet of Curly-Tiger Maple a year. We have one vendor that calls it Curly and another that calls it Tiger and I found out recently that they both get it from the same supplier. I cannot tell any difference, looks just alike, works the same, smells the same, the splinters hurt the same so I’ll tell you what I was told one time by an inspector. Call it what you want it’s the same thing some boards just have more profound curl than the other boards. Curly and Tiger Maple are used interchangeably to describe the same thing. Fiddleback maple does have origins in instrument making as the best wood for making that part of the fiddle is quartersawn curly material. I’m not sure though that the term is still necessarily used to describe that wood. When I’m buying I assume all three terms mean the same thing. 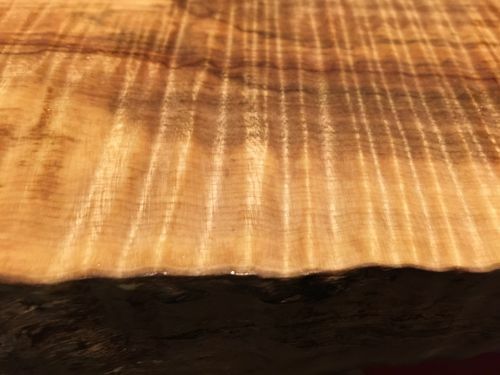 When I’m selling I will most often describe it as curly maple with medium or tight heavy curl. On occasion I will describe it as tiger maple but only when I know the client I’m selling to describes it that way. I have never described anything as fiddleback although if I had a very nice batch of quartersawn curly maple I’d be tempted. Same, but not really. Think of a wide board with tight grain on both sides and cathedral grain up the middle. The center cut on a log. If it has curly figure, it is less noticable across the center, and more pronounced on the tighter outside grain. Like a tigers back with the stripes on the sides. This is due more from the cut orientation than the figure. Standard milling produces tiger as you get more heartwood and the true curly is in the outer rings. On curly the curl will go uninterrupted from one side to another. Very interesting. I was told that Fiddleback was the old fashion term, originating from the use of the curly wood for fiddlebacks. The quilted figuring is one of my favorites, as it’s so unusual and mesmerizing. But then I’m easily mesmerized. People use the terms interchangeably. However, I associated “Tiger” as showing the straight figure lines that you see in quartersawn cuts, like the ash below. I agree with Steve, above. I have always associated “tiger” figure with tight, parallel stripes, like tiger stripes. I think tiger maple is a type of curly maple, but distinct from random curl you often see. 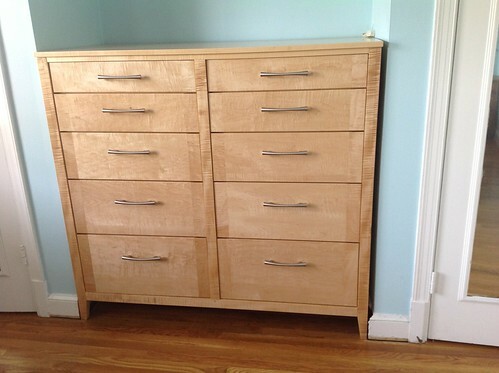 I consider the styles and rails of the chest in the photograph below to be “tiger” maple. 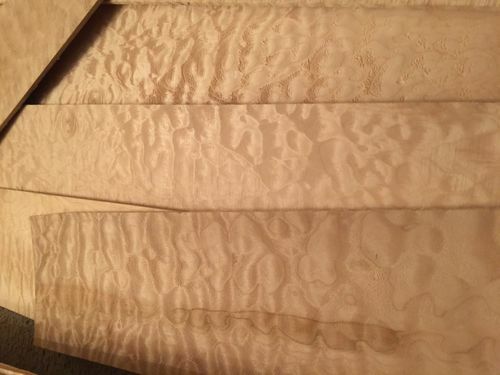 The drawer fronts are also curly, but random curl, not as distinctly tiger striped as the styles and rails. Most people consider them to be the same thing.